Some days are better than others. 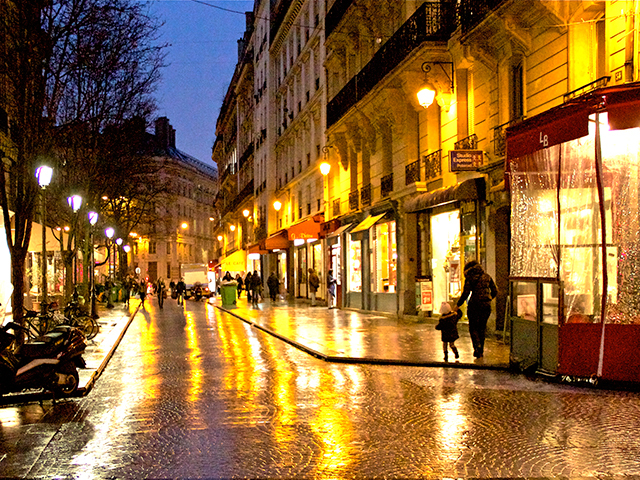 I spent some time in Paris over Christmas and New Years Eve back in 2011. My typical MO for exploring a new city is to go alone and start to wander. Paris is the perfect city for this sort of exploration. And the weather, while cold from what I’ve heard regarding the Parisienne norm, was a wonderful break from the subzero temperatures we have in Chicago all winter! Being the fashion city, I have to mention that. I am the least concerned about fashion here in the states, but in Paris, I prepared. I was able to wear a long black wool vintage 1950’s coat that gives the tapered, elegant lines of Audrey Hepburn (which I do not actually possess) but is not warm enough for the dead of Chicago’s winter. I added a pair of black classy gloves and some fashionable boots with a modest heel (a girl’s got to have some style AND still be able to walk at the end of her day!) and various neat hats and voila! With my brand new Louise Brooks style bob peeking out from under the hat, I felt like I fit right in. And I must have, because many, many people approached me and asked me for directions to various destinations in various languages. I felt a secret (probably undeserved) smugness about that. Then the Parisians started to approach me to chat. Yeah, we can just poke needles in that soap-bubble now. Sadly, while I pretend to be some intellectual French-speaking star here in the States, (and to my credit, I do speak it better than most Chicagoans-but that’s really not saying very much at all…most of us in the US didn’t study any French!) in Paris it was glaringly obvious that I was a tourist. Determined to not let my shame destroy new opportunities to learn and meet people, I employed techniques I’d learned while traveling through SouthEast Asia where I knew not one word of Thai, Khmer, Vietnamese, nor Laotian but had certain needs to convey. I flashed my biggest, most humble smiles and explained (in a well rehearsed French sentence that I’d repeated over and over prior to visiting the country) that I spoke very little french and I understood even less. I had heard all the horror stories about the Paris inhabitants being rude and nasty, or unsympathetic to the tourist who speaks little or no French, so of course I approached this city’s inhabitants with just a little bit of fear lurking just beneath the surface. Shouldn’t have been too concerned, I suppose. I think the sincerity, the honesty, and the eagerness to not be a ‘typical tourist’ must have shone through, because I found the Parisians to be absolutely delightful people. It snowed and rained quite often that week. I really didn’t mind either though. Being Christmas time the lights and decorations seemed to compete with one another in every little irregularly shaped block. But the best were the twilight scenes I encountered in the rain. This shot was just meant to be of the overall street scene with the light reflecting on the intricate pattern on the street. But the woman with her daughter walking along the sidewalk stole my heart. I’ve kept this photo in my collection since I first took it because it so perfectly summed up the excitement and enchantment that I experienced during my stay in Paris.